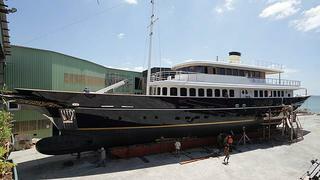 The 48.7m Bilgin Classic 160 motor yacht is now out of its shed at Bilgin Yachts and preparing for launch this week. The Bilgin Classic 160 captures the look and feel of a golden era in luxury yachting. Classic in style, she is packed with the very latest technology and appliances as well as displaying the very best in Turkish wood craftsmanship. A gentleman-style yacht, she has been built to RINA class and commercial standards and includes zero speed stabilisers to offer a comfortable and high performance cruising experience. Accommodating 12 guests in four double and two twin cabins, she is available for sale asking €11.5 million.